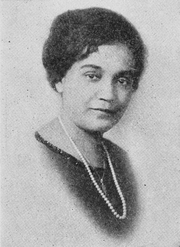 Jessie Redmon Fauset was born in Camden County, New Jersey. Her mother died when she was young, and her father, an African Methodist minister, remarried and moved the family to Philadelphia. She attended the Philadelphia High School for Girls and won a scholarship to Cornell University, where she studied Latin, Greek, German, and French, among other subjects, and became one of the first black women elected to Phi Beta Kappa. She graduated with a B.A. in classical languages in 1905, and worked as a teacher in Baltimore and Washington, D. C. There she met W.E.B. Du Bois, and began contributing to the magazine he had helped found, The Crisis. In 1919, she moved to New York City to become the magazine's literary editor. She hosted a salon at her apartment in Harlem was active in the neighborhood’s artistic scene. In 1929, she married Hubert Harris, an insurance broker, but kept her birth name professionally. She published her debut novel, There Is Confusion, in 1924, and would go on to publish three more novels, as well as poetry, book reviews, and essays. However, she is best known today for discovering and mentoring many other African American writers of the period, including Langston Hughes, Jean Toomer, Countee Cullen, and Claude McKay, for which she has been nicknamed the "Midwife of the Harlem Renaissance." Jessie Redmon Fauset is currently considered a "single author." If one or more works are by a distinct, homonymous authors, go ahead and split the author. Jessie Redmon Fauset is composed of 5 names. You can examine and separate out names.